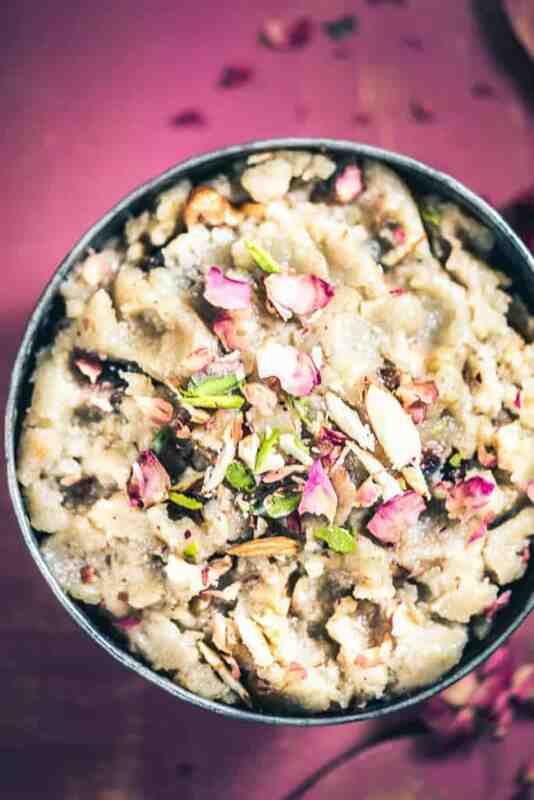 Bajre Ka Halwa is a soothing dessert or an accompaniment made using bajra ( Pearl Millet Flour ), whole wheat flour, ghee and heaps of dry fruits and coconut. 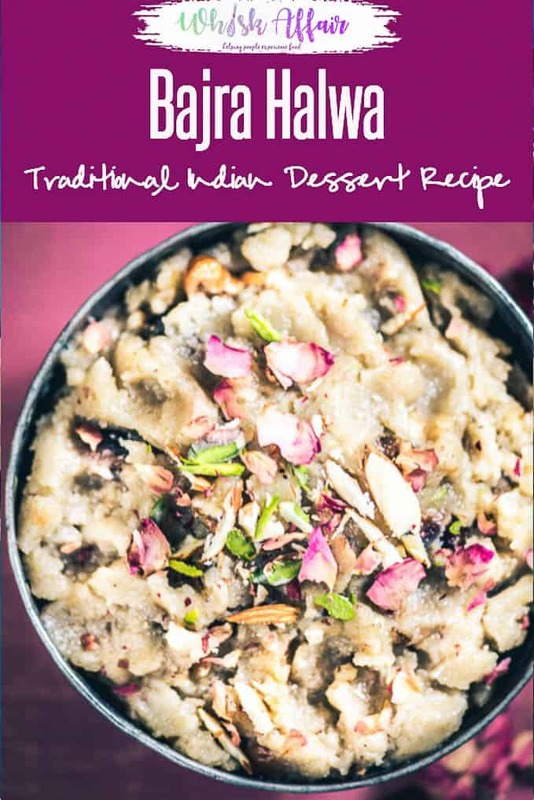 Here is how to make Bajra Halwa or Bajra Nu Halwa. Bajra is one of the most underestimated grains these days. Despite it being widely used across the rural India, we city dwellers often fail to contemplate or let alone appreciate the enrichment that is derived from this grain. Being coarse in texture, Bajra has innumerable benefits that you just cannot count merely on your fingertips. Apart from being an excellent source of energy, Bajra also lowers the level of cholesterol, aids in preventing heart disease, bolsters digestion, work for prevention of cancer et al. Hence, I always make sure to include Bajra in one or the other form in our diet by making Bajra Methi Poori, Bajre ki Roti, Gujarati Bajre ki Raab and even the fairly new addition in my recipe book: Bajre Ka Halwa. Now you must be wondering how can one make Bajre Ka Halwa, right? Well, trust me, it is fairly easy and super delicious. 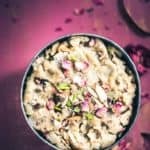 Bajre Ka Halwa is a soothing dessert or an accompaniment made using bajra, whole wheat flour, ghee and heaps of dry fruits, coconut. 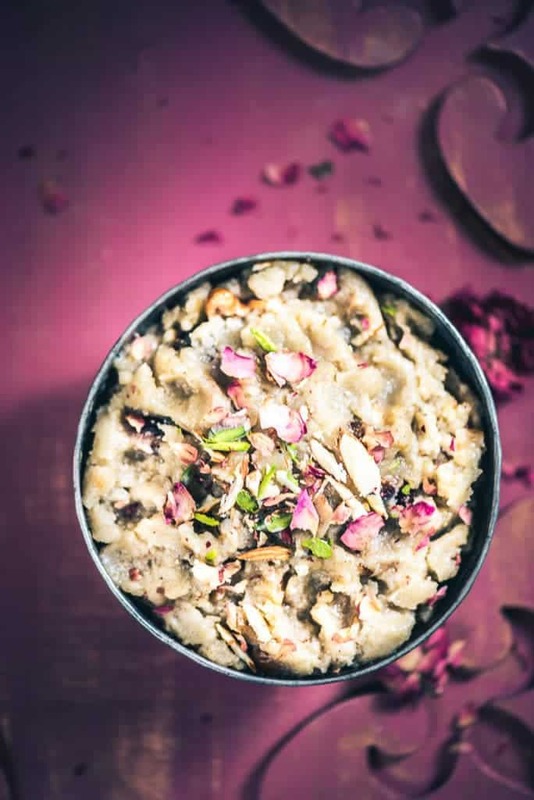 Bajre Ka Halwa is a soothing dessert or an accompaniment made using bajra ( Pearl Millet Flour ), whole wheat flour, ghee and heaps of dry fruits and coconut. Add almonds, cashew nuts, dry coconut and raisins and fry until slightly browned. Add bajre ka atta and whole wheat flour in the ghee and fry on medium-low heat until browned and fragrant. It will take 10-12 minutes. Add water and sugar and cook until halwa thickens. Add the fried dry fruits and cardamom powder and mix well.